Oh wait, that's me. That's right! For the past month, I have been willing hostess to the bunch of bakers known as The Daring Bakers, consisting of over 1,000 bakers all over the world who unite once a month to make the same recipe. I know we all made Cheesecake Pops last April, but I wanted to pick a recipe that people could take and really make their own, letting the creativity flow. And wow, have they ever. If you want to see for yourself, head over to The Daring Kitchen and click on the blog roll. I've seen everything from people making their own cream cheese to vegemite cheesecake. And what did the vegans do? You need to check it out. The recipe I pick comes from my friend Abbey T. who loves to bake. I called it "Abbey's Infamous Cheesecake," and the grammar police think it should be "Abbey's Famous Cheesecake," or "Infamous Abbey's Cheesecake." Whatever you want to call it, the basic recipe alone is to die for - I have never had a creamier cheesecake! But the instructions to the group were to do whatever they wanted with it, as long as the basic recipe was followed. And if they felt secure in their cheesecake making, to focus on really making their dessert look beautiful, like a centerpiece. Of course, by needing to taste the recipe ahead of time, I've been making cheesecake for two months. Some were more successful than others, and my co-workers don't seem sick of cheesecake yet, but I'm ready to move onto something else for a while. Ha! Here is the recipe. I would say that it can be made without a water bath, but if you take the trouble, it is even creamier, and completely worth the effort. ** Cafe au lait cheesecake with caramel - take 1/4 cup of the heavy cream and heat it in the microwave for a short amount of time until very hot. Add 1-2 tbsp. instant espresso or instant coffee; stir to dissolve. Add this to the remainder of cream and use as normal. Top cheesecake with homemade caramel sauce (I usually find one on the food network website - just make sure it has heavy cream in it. You can use store-bought in a pinch, but the flavor is just not the same since its usually just sugar and corn syrup with no dairy). ** Tropical – add about a half cup of chopped macadamias to the crust, then top the cake with a mango-raspberry-mandarin orange puree. ** Mexican Turtle - add a bar of melted dark chocolate (between 3 and 5 oz., to taste) to the batter, along with a teaspoon of cinnamon and a dash of cayenne pepper (about 1/8 tsp.). Top it with pecan halves and a homemade caramel sauce. ** Honey-cinnamon with port-pomegranate poached pears – replace 1/2 cup of the sugar with 1/2 cup of honey, add about a teaspoon or more (to taste) of cinnamon. Take 2 pears (any variety you like or whatever is in season), peeled and cored, and poach them in a boiling poaching liquid of port wine, pomegranate juice/seeds, a couple of "coins" of fresh ginger, a cinnamon stick, and about a 1/4 cup of sugar. Poach them until tender, then let cool. Strain the poaching liquid and simmer until reduced to a syrupy-glaze consistency, then cool. Thinly slice the cooled pears and fan them out atop the cooled cheesecake. Pour the cooled poaching syrup over the pears, then sprinkle the top with chopped walnuts and fresh pomegranate seeds. **Key lime - add zest from one lime to sugar before mixing with cream cheese. Substitute lemon juice, alcohol, and vanilla with key lime juice. During my two months of cheesecake baking, my favorite version was the coffee cheesecake with caramel sauce (the first one in this post). 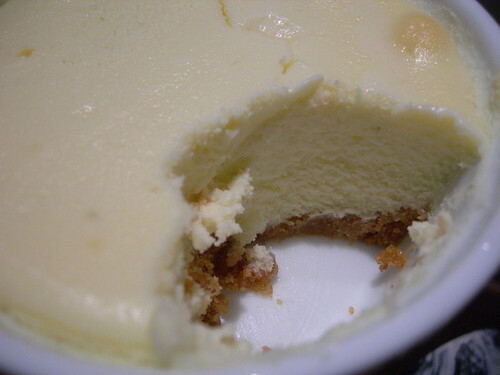 A close second were the key lime cheesecakelets baked in ramekins (so creamy!). The Mexican chocolate cheesecake that I made just wasn't chocolatey enough for me, and then I had two moments of cheesecake fail. The first happened when I replaced the graham cracker crumbs with Oreos (which have a lot more fat in them) and it spewed all over the bottom of my oven and smoked up my house. The second was this idea that was brilliant in conception but not so great in practice - the Smores Spectacular Cheesecake. I actually ended up throwing it away. But I'm definitely going to file away what worked well for everyone else and pull this recipe out the next time I need something to bring to a party! A huge thanks to Abbey T., and a heartfelt applause to the many Daring Bakers out there, whether this was your first cheesecake or one thousandth. You all made hosting this challenge a blast! ETA: P.S. For those of you who tweet, I added a second Twitter account just for my baking. Now I can tweet about my thoughts on recipes or ideas, and not just blog once a week! Jenny I love cheesecake and was so pleased with this month's challenge! This cheesecake is definitely a keeper. Your key lime cheesecakelets sound divine. I hope to get my post up in the morning. Thanks for a great challenge this month. I really enjoyed it! Sure, I've made cheesecake before, but it's always fun to try a new recipe. And I appreciate that you let everyone be so creative. It was a great recipe and a definate keeper. Thank you so much Jenny.. you were a fantabulous hostess! And please thank Abbey for all of us.. this really is a to-die-for recipe. Not only was Abbey's recipe spectacular, but this was a fantastic challenge Jenny! The creativity it unleashed is amazing! Thanks for being the hostess with the mostess, for giving so many variations, and choosing such a great April challenge. Love the first photo. Truly drool worthy. Wow thanks Jenny for one of the best cheesecake recipes I have ever made. It is so forgiving and so easy to make sweet or savoury. Just love your photos. Yes the DBers really went to town on this one. Thanks you for the advice that you gave on this challenge. Bravo Bravo Bravo. Thanks for a great challenge! I had fun and it turned out great. I feel wonderfully successful :). Looks perfect. Thanks for the great challenge! I made a strawberry cheesecake flavored ice cream -- I hope it's acceptable. Such an fantastic challenge! Thank you so much for hosting; you did an amazing job and I loved the recipe. :) Your cheesecakes look really yummy! Thank you so much for such a fantastic challenge Jenny!! In general cheesecake isn't my favorite dessert, but I thought this was a really delicious recipe. Thanks for the choice, and for allowing us so much creative freedom! thank you for a great challenge Jenny! i agree, water baths really make the cheesecake so creamy! This is the best cheesecake recipe I've ever made! Thank you for choosing it! This turned out to be a very nice recipe so thanks very much for the opportunity. I had fun making my variations! I'll have to hang on to this one to try a few more ideas. Jenny, thank-you so much for such a fun challenge! I had a great time making and decorating my cheesecake! Love the first picture of the cafe au lait cheesecake. Very decadent! Your cheesecake looks beautiful and so tempting! Thanks for having chosen that great recipe! Thank you for a wonderful and inspiring challenge, and the best cheesecake recipe ever!! Just learned about your 'event' through Nofearentertain's post. What a great idea your challenges are. I'm now a fan and can't wait to give your next one a try. Thanks for being a wonderful host this month - I was awed by the sheer variety of cheesecakes that emerged from people's imaginations. Your cheesecake looks just devine. Enjoy your well earned escape from cheesecake! Thanks for hosting Jenny. I had lots of fun with this challenge. Thank you for hosting this month! It was a great challenge and I really had fun with it! Thanks for a lovely challenge with which we could play around with. Great challenge, and thanks for being such an awesome host! It was nice to have so much freedom with the challenge. Oh Jenny it was grand. Only problem now is I really would love a slice of your coffee cheesecake with caramel sauce!!! Coffee and caramel, that is so classic for fabulous flavor! Great job hosting and thanks a cheese cake. Thanks for such a fun challenge. I really enjoyed trying to think of a new way to do cheesecake and I liked how creamy this recipe was. This might be the best cheesecake I've ever had. Thank you so much for sharing the recipe!! Absolutely delicious! Thank you for hosting, the recipe is definitely a keeper! What a delicious challenge you chose for us! Thanks for hosting this month and sharing Abbey's recipe. I have been excited to see what you would make. It looks wonderful. Thanks for a great challenge. Thank you Jenny for such a great challenge... and such creative freedom! Yours looks simply amazing! ...and I'm sure it was as tasty as it is beautiful! Now this would have been a challenge I could get behind! Looks fantastic Jenny. I am so glad you chose this! It allowed me to make my favorite cheesecake EVER! I noticed that you're from Greenville! My husband and I live in Clemson now but are moving to Greenville at the beginning of June- we are very excited! Thank you Jenny for such a fun challenge! Caramel and cheesecake are always perfect together! Oh my gosh Jenny! 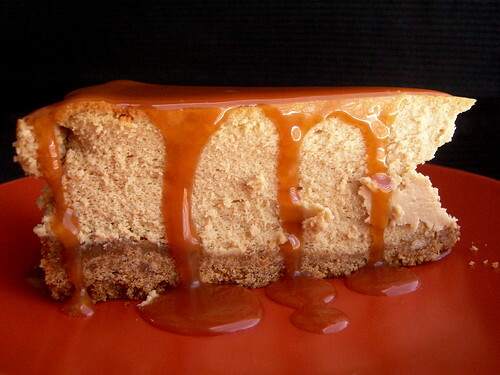 Coffee Cheesecake with Carmel sauce? Those are my two favorite things! This was my first Daring Baker's Challenge and I was thrilled that it was cheesecake. Since I was a DB virgin...I thought I was going wild and crazy by using something different for my crust! Thank you for the wonderful challenge this month! I had great fun making it, and my work mates had great fun devouring them! Thanks for the challenge! This was my first time making cheesecake. It didn't go very smoothly, so I can't wait to try again. The recipe was delicious though!! Yours looks amazing! This was a great challenge Jenny. I would not have tried this recipe because I already feel like I have the best cheesecake recipe. Wrong. This was the best, truly. Oh drool! That cheesecake looks gorgeous. Thanks for such a wonderful challenge. Drips of caramel over coffee cheesecake, it sounds and looks so good. Jenny, I love this recipe! I've never made a whole cheeecake, just cheesecake cupcakes. It was SOO good! I made the Key Lime one, super good. It will definitely be in my go to Cheesecake recipe, it was amazing! Your cheesecakes look amazing, and I'm sure your coworkers love that you just "had" to bring in cheesecake all the time! Thanks for the great recipe! Jenny, thanks for hosting this month's Daring Baker. This was a fabulous recipe! Great choice. Wow this was one heavenly cheesecake. Thanks so much for such a delicious challange. Your cheesecakes look divine! Thank you for hosting and choosing this month challenge Jenny. I had fun of making this cheesecake. It was delicious! Jenny, thank you very much for choosing a cheesecake for us to make and being a great host. I have never made a baked cheesecake before and I made two entirely different eggless versions. Your recipe produced a very creamy and delicious cheesecake which I'm going to keep using from now onwards. My thanks to your friend Abbey too. Thanks for the great recipe! This was the most delicious challenge ever!!! And except for the crust it was even gluten free- Thank you, thank you! Jenny, thanks so much for a great challenge and recipe! Naturally, your cheesecake looks divine! Great job! it was an awesome first challenge for me. Thanks so much for that. jenny a lovely challenge thanks so much for sharing your friends creamy cheesecake! it really was the best i have ever had! This cheesecake was fantastic - thank you for being such a lovley hostess! Thanks for the challenge Jenny! Wonderfully creamy smooth cheese cake. It is now my absolute favourite of all cheesecake recipes I made so far. Mine was a wonderful white chocolate cheesecake on a crust of 5spice cookies (speculaas). Very VERY good! Thank you for a fun challenge! Your cheesecake looks wonderful! Thanks so much for hosting this month, Jenny! Jenny thank you for this challenge, i got to make my fav cheese cake at home. Thanks for hosting this challenge and allowing for so much creativity. I had fun! Thanks for this wonderful recipe! I love it, its my new fave. Thanks Jenny, for the choice of challenge. It was great that you allowed us to experiment a little and be creative! This was an awesome challenge!! Thanks for choosing cheesecake =D! Jenny, thanks so much for hosting the challenge. This cheesecake recipe is absolutely delicious! It will be my new go to recipe. Thanks for the freedom on this challenge - it was really fun! Oh, and the texture of this cheesecake? Spot-on perfect. Thanks for hosting this month! Your cake looks delicious and my family and I very much enjoyed this treat! Jenny, thank you for such an amazing challenge! It was my first month as a DB and I thoroughly enjoyed it. Your cheesecake looks super creamy and delicious... Mmm! Jenny, thanks for the challenge!! Wow - two months of cheesecake baking? Dedication! Thanks for the recipe. It was fantastic. I made cheesecake cups topped with boysenberry syrup and blueberries. Yum! Thank you Jenny for hosting this challenge and for the great recipe! It's going to be a new staple of mine! Thanks Jenny for picking this lovely cheesecake recipe! I never used to like cheesecake as I didn't particularly care for the taste of the ones I had tried before, so I was a little anxious about this recipe being my first cheesecake ever. But the taste was just absolutely perfect!! Loved the challenge and your cheesecake looks lovely! thanks for picking such a perfect, user friendly, and delicious challenge that also enabled us to be creative! this recipe will be made again around this house. Thanks a lot for a yummy challenge! Jenny! Thanks for the great challenge this month. I know its not easy hosting so many, many thanks. The recipe was great and we all enjoyed the cheesecake. Yours looks pretty darned superb as well! What a great challenge, so fun!! Thanks for a fabulous choice, and a wonderful recipe! Oh - another baking Jenny!yummy things on your blog....! Oh me oh my; does this cheesecake ever look GOOD!!! Ijust discovered your blog - love it! - and am looking forward to reading more! Just now posting my photo, etc, for some reason I thought today was the 27th...oops. Mine ended up a dark chocolate chili cheesecake. Thank you so much for hosting, it was a wonderful recipe and the encouragement to experiment was great. What a nice looking cheesecake! thanks for hosting jenny! Thanks so much for this challenge! I loved the free reign for creativity you gave us. It made it really fun! Thanks a bunch! thanks to you and your friend for a great recipe! What a nice challenge, cheesecakes are one of my favourites, thanks for hosting a great challenge. by the way your cake is calling my name!!!! You rock! I've made a lot of cheesecakes. I am not a huge cheesecake fan. But this recipe - THE BEST. I think if people don't like cheesecake, they just haven't tasted THIS ONE yet :) Thank you for hosting. You are teh goddess! Jenny thanks for being a wonderful hostess and for a keeper of a recipe. Love the caramel sauce on your cheesecake! Sounds like a fantastic cheesecake recipe. Thank you for choosing such a great challenge! I'm not big fan for cheesecakes but I'm converted now. I love your cheesecake which looks so soft and creamy. Again, thank you so much! Thanks for hosting this month's challenge! The cheesecake was outstanding! Jenny, take a bow! You did a great job hosting the challenge on your own and you chose an amazing recipe. Based on all the interpretations, people really took to this challenge. Thanks for being such a great hostess! Thanks to you, my first Daring Bakers challenge was a success! Coffee and caramel are a perfect match. Your cheesecake looks gorgeous. Thanks for sharing Abbey's recipe with all of us. Though I'm not exactly a huge fan of regular cheesecake, indeed this is very creamy and delicious. Do you remove the icing in the Oreo cookies? I have done that and it worked...plus, it not overly sweet. Definitely like the coffee and caramel version...mmmm..mmm.!! :) Thanks again! Thank you so much for hosting this month's challenge Jenny.. Especially thank you so much for the Fantabulous recipe that have made me a cheesecake convert. Please give Abbey a hug and a kiss from all of us for sharing his (in)famous recipe. The first pic is the money-shot! Wow. Drool. Thank you SO MUCH for the recipe and for hosting this month's DB. I certainly had a lot of fun! Thanks for all the hard work you put into this challenge. It was fun to create a cheesecake of our own with a great base recipe. I loved this challenge- and this is totally my new go-to cheesecake recipe. Thanks so much for hosting the challenge! Thank you for the wonderful challenge this month. Your cake looks fab-U-lous!! Jenny this challenge was, in a word, Fabulous! Your cheesecake looks delicious! And I love that you prepared for it by making cheesecake for 2 months before! Thanks for hosting this month - I know I wasn't feeling particularly inspired this month, but then a good part of that was a lack of time, not the recipe itself. Great to have coworkers who will eat what you make - mine are on weight watchers so won't touch things. Jenny, thanks for a stellar hosting job this month! The cheesecake is divine, and I'm so glad to have the recipe in my baker's arsenal. So delicious! Congratulations on a challenge well-hosted. Hi Jenny, thanks for stopping by my blog and commenting on the mango cheesecake. This is my first DB challenge, and I had never made cheesecake before. I also appreciated your allowing us to be creative -- the amount of variation was incredible! I'm a terrible baker, but I had beginner's luck. Thanks for making this possible for me. Thanks for stopping by my blog. I had fun with your pick, something people love and it can played with so many flavors. Jenny! Thank you very much! I love your cheesecake and congratulations for your blog is fantastic and thank you for writing me. I'm happy to meet you because i'm going to learn a lotof you! I LOVED this challenge as well--I don't think I have ever been prouder of a dessert that I've made. 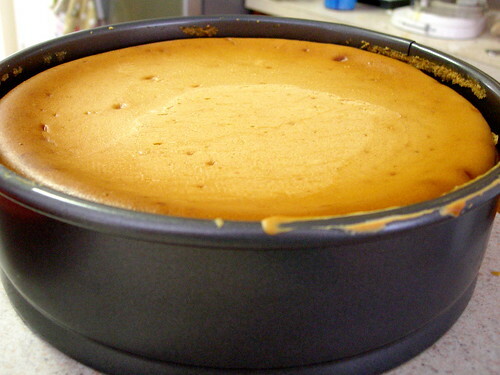 Your plain cheesecake, btw, looks heavenly and makes me want to make another one. Yikes. Thanks Jenny! Loved the cheesecake recipe! I love my own cheesecake recipe so much, I never would have branched out without this impetus. I'm so glad I did. I have a new favorite and got so many great ideas from everyone. Amazing recipe! 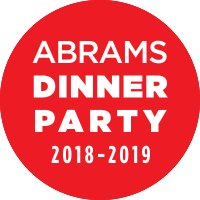 THX for hosting, I know it takes some time to experiment and pick a recipe. This cheesecake is a keeper. My family really loved it. Thanks for this great challenge! Even though I waited until the last minute to bake mine, I was so glad that I did. The recipe was perfect! Jenny, thank you for stopping by my blog. It is me who has to thank you for choosing such a great challenge. I enjoyed both making and eating the cake:)Thank you!!!! Jenny thank you for hosting this fun challenge. (I'm late to the party, I know. )I didn't make the connection that you were this months host, due to your new avatar on the DB forum. I only knew your avatar from the top-left of this blog and your comments on other blogger-powered blogs. Thanks for sharing this great recipe. It's so fun to see how everyone made it their own! Great job! I'm having a linky party called A Themed Baker's Sunday and this week's theme is Cheesecake! I'd love it if you dropped by and link up! And join us for next week's theme: Cake/Cake Pops!